Do Dried Herbs and Spices Have Nutritional Value? Q. Do dry herbs and spices have the same nutritional benefits as their fresh counterparts or are they only good for flavor? A. It depends on which herbs and spices (and which nutritional benefits) you’re talking about! Cinnamon, for example, is only consumed in its dried form but powdered cinnamon has been shown to help modulate the rise in blood sugar after meals. Ginger can be used either as a fresh root or as a dried powder but either way, has anti-inflammatory benefits. Same with garlic and onions. Dried spices like cloves, cinnamon, and black pepper all have high ORAC scores, which indicate antioxidant potential. A teaspoon of these spices is comparable to a serving of blueberries or strawberries. Clearly, there is still plenty of nutritional benefit to be had from dried spices. When it comes to green herbs, some nutrients–and some flavor compounds–will inevitably be lost in the drying process, and more will be lost with extended storage. But that doesn’t mean that all dried herbs are nutritionally worthless. How Do Fresh and Dried Herbs Compare, Nutritionally? One ounce of fresh basil, for example, provides 30% of the DV for vitamin A, 145% of the DV for vitamin K, 8% of the DV for vitamin C. It contains 88mg of omega-3 fatty acids and has an ORAC value of 1200. One tablespoon of dried basil (which is roughly the same amount) provides just 4% of the vitamin A, 43% of vitamin K, and only 2% of vitamin C. It only has about 33mg of omega-3 fatty acids. Apparently, quite a bit is lost in the drying process–although a third of a day’s supply of vitamin K is nothing to sneeze at. It’s also possible that the dried basil they analyzed had been sitting on the shelf for a while and that a fresher sample would have fared better. And despite the loss of certain nutrients, the ORAC value of equivalent amounts of dried and fresh basil is actually about the same, which suggest that both are a significant source of antioxidants. For maximum flavor and nutrition, you want to pick your herbs right before you use them. All fresh vegetables–including herbs– will lose nutritional value just sitting in your refrigerator, or the grocer’s case. See also my podcast on growing and using herbs. When fresh herbs aren’t an option, dried herbs still are a source of both nutrition and flavor. But again, I wouldn’t expect a whole lot of flavor or nutrition from a dusty bottle of dried herbs that’s been in your cupboard for several years. Every fall, I dry a supply of oregano, rosemary, mint, and thyme—just enough to get me through the winter until I can start growing them outside again. Anyone try growing Tulsi Holy Basil? I’ve heard the taste is not very good, but it is quite healthy? ! 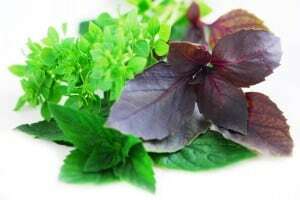 With so many herbs that taste good and are good for you, why grow one that doesn’t taste very good? I grow not only holy basil but six other different breeds, sweet, lemon, lime, cinnamon, liquorish and plain . Holy basil contains Eugenol which is one of the strongest cancer fighters on the planet. I also think it the buds and flowers taste really good, the buds before they flower taste a little like watermelon and I’ll bet you’ll love or come to love the taste of Holy Basil and you can feel the Eugenol absorb into your tongue. Even my dog loves it, holy basil is one of the ones he’ll chew on which is amazing for his health and yours. Great answer to an interesting question. I’ve become hooked on these Dorot brand cubes of frozen herbs. They’re not like fresh, and probably have fewer health benefits, but they’re sure easy, and save a lot of time. Along those lines, how do frozen herbs compare to fresh or dried? Planning a big garden with lots of herbs. Who said tulsi doesn’t taste great! I have always just loved chewing on the leaves. It is also very easy to grow here in India. Pingback: Leon's Thought for Food » Spices and fresh herbs will add nutritional value and flavor to food while offering medicinal properties. I am doing some research about the value of dried verses fresh herbs and other plants. Can you please send me the research that backs your findings? Please? What about freeze-dried herbs like e.g. in my case it’s chives, parsley, dill, sage and alike? Do they have still some nutritional value or should I dismiss them instead? Some situation in life and one haven’t the possibility to always use fresh herbs, so this is quite interesting for me to know. Can someone please tell me if I can mix some herbs and spices with my morning cornflakes cereal, how I should do it. The only herbs I would think might taste good with corn flakes are cinnamon, nutmeg and maybe a tiny dash of sage. If you are trying to take the other herbs for health reasons, you just need to get them in you, I put then into a pill capsule. You can buy them really cheap but I just found pills I had extra of, opened it and emptied it and put my Essential Oils in the large side, put the cap on and swallowed a nice dose of medicine quicky and painlessly. I did taste the lavender a bit when I burped shortly after taking it, but just that once. I’d suggest using them in a soup if your just wanting to season your food. The herbs in a soup broth, and cooked for a while getting all benefits out of the leaf, tastes really good with lots of garlic, oregano, Rosemary, onion etc. It doesn’t much matter how, just get this stuff in your body! Does ground Turmeric loose nutrients over time? I know flavor can be affected but does the nutritional properties still remain? Please help. It might lose some but I don’t know of any analysis that quantifies how much may be lost. It wouldn’t lose all its nutritional benefit, though, that’s for sure. In containers without much crushing. soup and dips. Used every day!